My name is Dr. Laura Kaplan-Weisman, and I am a family physician from Maryland. I provide primary care to people of all ages and all walks of life, and I feel strongly that what our country needs now is universal health care. 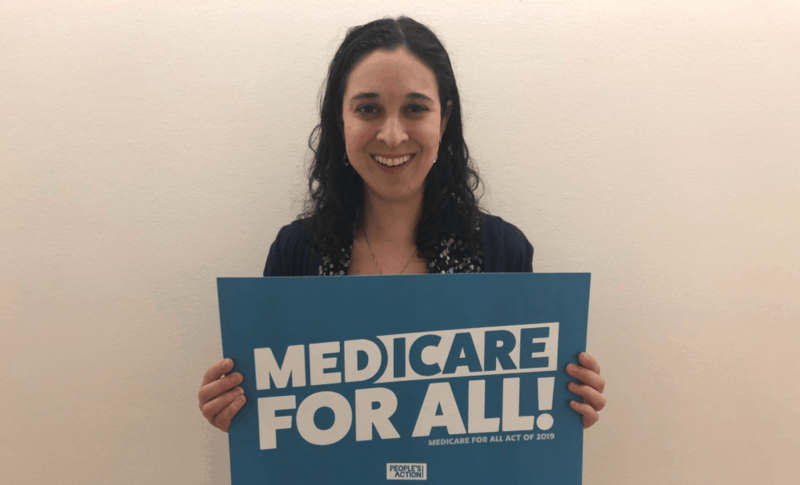 That’s why I traveled to Washington to stand with Senator Bernie Sanders as he introduced the 2019 Medicare For All Act. The Affordable Care Act (ACA) has improved access to health care, but necessary treatments remain unaffordable for average Americans. I could tell stories for hours about patients I know whose health has worsened because they can’t afford to see physicians like me, fill their prescriptions, or get essential tests. Maryland’s “All-Payer” system expands ACA coverage and enables hospital patients to reduce costs. But it only applies to hospital care, not outpatient visits or medications. And every year, patient co-payments go up, while insurance and pharmaceutical companies reap record profits. These profits enrich executives, but they don’t benefit our health. One of my patients is Mike, a 38-year-old teacher and father whose diabetes and high blood pressure are uncontrolled because he can’t afford his $50 copayments for medical visits and medications. This comes on top of his already high bills for supplies to test his blood sugars, which are not covered. Last summer, symptoms of uncontrolled diabetes and blood pressure made it impossible for him to work, and he had to go on disability for months to regain his health. Alan is a 50-year-old woodworker with painful arthritis. His insurance plan will only cover a single orthopedist within fifty miles of his home; he can’t afford to travel that far. He also can’t afford to take off work to have knee replacement surgery, so instead he comes in monthly for steroid injections and to remove liters of fluid from his swollen knees. Another patient of mine is Louise – she’s a 62-year-old former secretary, who had to quit her job and spend all of her savings caring for her dying mother. After her mother passed away, she was unable to get another job, so she ended up living in a homeless shelter. Have I told you yet about Dolores, the 75-year-old former model and then owner of a dog-walking service who had to spend all of her life savings on medical treatments for fibromyalgia, chronic fatigue, and back pain, before she, too, was forced to move into a homeless shelter? As I said, I could go on for hours. My heart constantly goes out to patients I’ve met like Mike, Alan, Louise and Dolores, but their stories are just a few examples of how I see patients grow sicker every day due to the rising, unaffordable costs of healthcare in the the United States. And why should one’s health insurance be tied to your employer? Why must my staff spend hours each day calling health insurance companies for prior authorizations for routine procedures like mammograms, generic hypertensive and diabetic medications that have been around for decades, asthma inhalers, and other low-cost treatments? It doesn’t have to be this way. It is important to remember that we did not arrive at our current healthcare payment system for moral, ethical or inevitable economic reasons. Dozens of other countries provide already universal care at a far lower cost. In Canada, universal healthcare first passed in the province of Saskatchewan in 1947. Province after province followed, but it took until 1966 for the rest of the Canada to adopt universal healthcare. In the United States, Massachusetts offered near-universal health care to its residents in 2006, and this became the model for the ACA. Other states, like New York and Maryland, are taking their own steps towards single-payer health care. The success of these programs demonstrates that it is possible to offer more, and better, care for less. With Senator Sanders’ Medicare For All, we can hopefully, finally, agree to pass it nationally. We can show what it means to truly care about the health and future of every American.